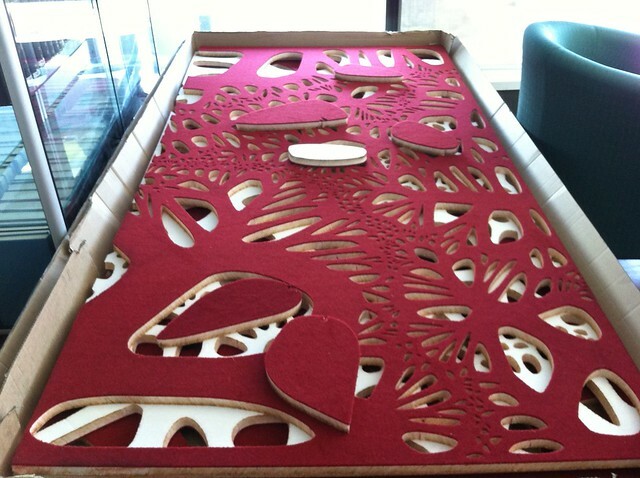 Developed for a seminar room at Monash University Caulfield Campus, August 2011. The room needed special acoustic treatment due to a number of hard reflective surfaces and its use for seminars and video conferencing. While it would be possible to use a plain acoustic foam treatment, there was an opportunity to develop something with more visual interest, that reflected on the lost natural environment in which the campus is located. 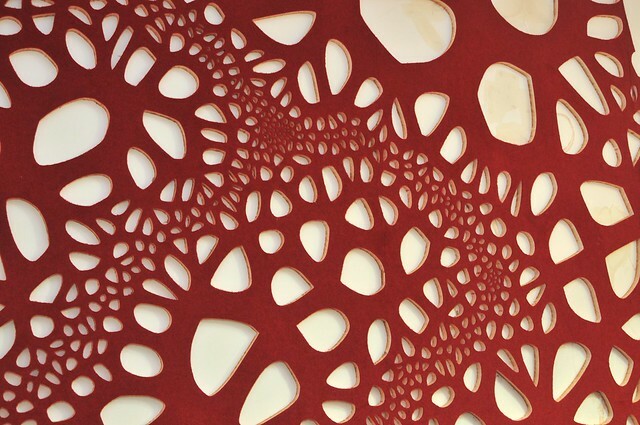 The work is uses a modified Voronoi partitioning algorithm. The points in the space are based on corridor formation and degradation in natural landscapes, such as river flows. The study above is from Simon Bell’s “Landscape : pattern, perception, and process”, London: E & FN Spon, 1999, and shows the gradual loss of pattern diversity in a natural landscape (Willamette River, USA) from 1850 (bottom) to 1995 (top). A river flow and degradation simulation was carried out resulting in a meandering flow pattern, which formed the basis of point allocation upon which the Voronoi architecture partitioning could be applied. 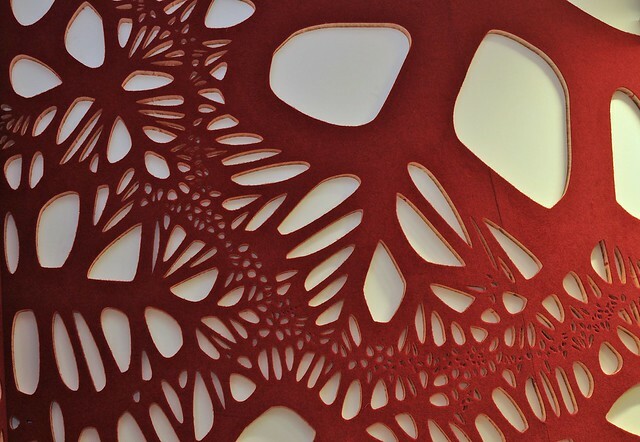 Following the river simulation, the space was partitioned using the Voronoi algorithm and the subsequent polygons used as control hulls for B-spline surfaces, giving the resulting shapes a natural softness. (click on the image above for a higher resolution version). 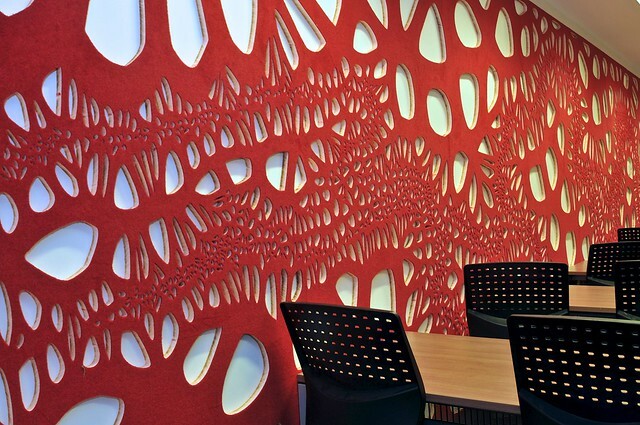 The pattern was then partitioned into 14 separate tiles for each uncut acoustic panel (about 2m x 1m). These 14 files were then converted to a CAD format and sent for cutting by Arrow Laser in Melbourne. 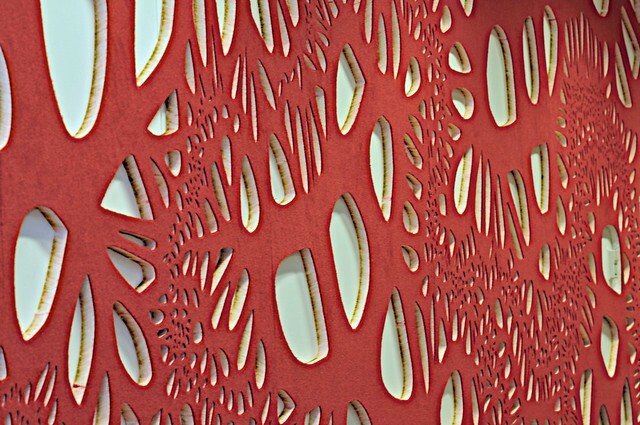 The cut panels were then reassembled in order and attached on the walls. The flickr set below shows the final work in situ. Click on a thumbnail image to enlarge. 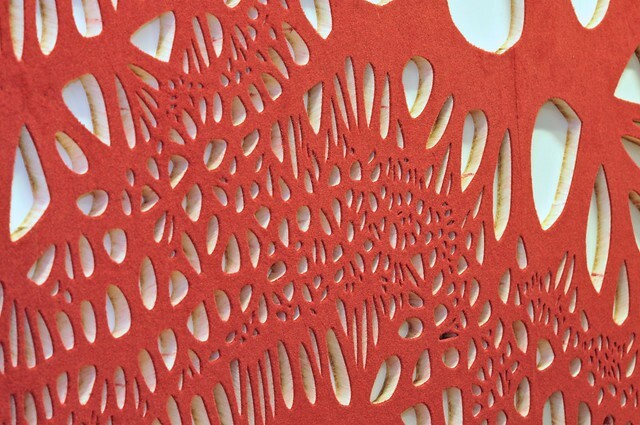 The work is located in Room H7.84, Building H, Monash University, Caulfield Campus. 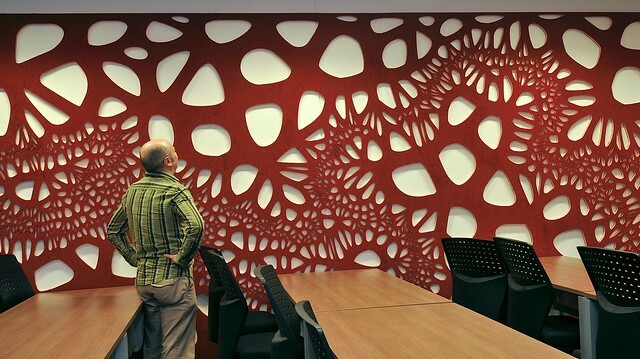 Monash University, Caulfield Campus, Seminar room features "Voronoi Wall"